As a dedicated coffee fan and home barista, you’ll no doubt have heard about siphon coffee makers. In fact, coffee made using a siphon brewer is so hard to beat, it’s actually behind some of the best baristas in the universe. And it’s massively on-trend in the world of home brewing right now too. Now, making a brew using a siphon coffee maker requires effort and a fair degree of caution, but the process of vacuum brewing is so fun and so satisfying, we reckon it could become your next big caffeinating adventure. We thought you’d appreciate some of our trusty Roasty advice on how to choose one of these complex, yet beautifully ornamental brewing gadgets. Correct? That’s why we’ve taken time out to review 5 of the best siphon coffee makers that the marketplace currently has to offer. But before we get to the reviews, let’s explain a little more about siphon (or vacuum) coffee makers … just so that you know what you’re taking on. So, just what is a siphon coffee maker? Yes, a siphon coffee maker is that intriguing whatnot that looks like something out of a school chemistry lab that you’ve noticed on the counter in a few super-trendy hipster coffee shops. But you never knew what it was, right? A siphon coffee maker is a full immersion brew system. The first chamber of the system uses a direct heat source to create a vacuum (siphon) in one chamber by forcing water upwards and into the other chamber. The hot water steeps the coffee grounds, and the brew then drains back down into the bottom chamber. And what’s so cool about a siphon coffee making system? There are four main elements to the siphon coffee making method that make it super-cool. As you may be aware, total immersion means that the coffee grounds and all the water in the system are in contact throughout the whole brewing process, just like Aeropress and French press brewing systems. Total immersion steeping typically produces a light, clearer flavored brew. Once your coffee grounds have steeped in hot water for a while, the vacuum created in the bottom chamber drags the coffee-rich liquid back down through the system’s filter. This method effectively captures any remaining solubles (and flavor) from the coffee grounds. The result will be a cup of coffee that’s deliciously pure in aroma and carries every nuance of flavor from your preferred grind. Unlike other methods of brewing that require pre-heated water to be poured over the grounds, a siphon coffee maker is heated continuously. As you know, the temperature is a crucial element of brew quality. A constant, consistent heat source gives you much greater control over the quality and flavor of the finished brew. Okay, now, strictly speaking, the look of this device is not vital to the result. However, you have to admit that displaying one of these bad boys on your kitchen countertop will surely impress your guests. 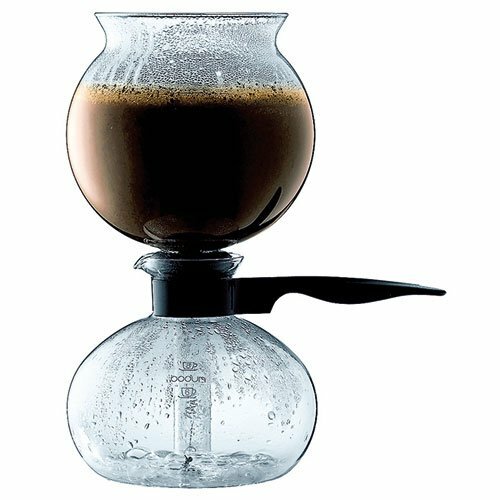 So, let’s have a look over our favorite 5 best siphon coffee makers. We’ll then talk in more detail about how you should go about choosing one. For the full spec of each machine and to read what other purchasers think about their buy, click on the links provided. For those home baristas who don’t want to risk blowing a fortune on their first siphon coffee maker, this neat and compact offering from Yama is definitely the way to go. This stovetop brewer is available in 22-ounce and 40-ounce sizes so that you can choose the right one for your needs. The design is very simple, and it’s pretty much fool-proof to use. Although this siphon coffee maker does the job, you must bear in mind that you get what you pay for. The glass is rather thin, making breakage a possible issue. Sometimes the seal between the two chambers is less than perfect, causing drain issues. 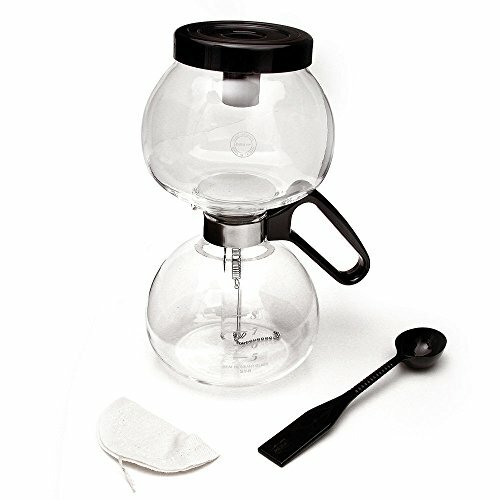 The Hario Technica is a Japanese-made, standalone siphon coffee maker. Although it’s still within the cheaper options we’ve looked at for you; this brewer is of much higher quality than the Yama stovetop unit. The Technica is a classic, standalone siphon coffee maker. The unit comes in a 3-cup or 5-cup size, complete with a separate alcohol burner. The simple yet stylish design is also very easy to use and straightforward to clean. The main downside is that the alcohol burner can be slow to heat the water so that you won’t be making a brew in a hurry with this unit unless you pre-heat the water independently of the machine. We found Bodum’s PEBO siphon coffee maker to be of exceptional value, considering it can brew eight cups of consistently superb-tasting coffee in a little under 10 minutes. The unit has a reusable plastic filter, rather than a cloth one, making it really quick and easy to clean, especially if you use fairly coarse grounds. Note that the brewer doesn’t come with a burner, although you can use it with an electric or gas burner, as long as you place a diffuser between. This is quite a sizeable unit, so be sure you have plenty of space for it on your countertop or in your kitchen cupboard. For those bean-heads with a bigger budget, look no further than Yama’s ceramic 20-ounce siphon coffee maker. In addition to producing a superb cup of coffee, this elegant, vintage-look piece will look absolutely fabulous on your countertop or even displayed elsewhere in your home when it’s not in use. The well-designed and attractive siphon has a sealed interior, capturing all the coffee flavor that other methods such as French press lose in translation. You can brew 20-ounces of coffee in one sitting with the Yama, making it ideal for a household with modest requirements. The machine is pretty weighty too, making accidental breakage less likely. The price may be out of reach of some folk, but if you’re serious about home brewing, the Yama is absolutely worth every penny. With the unit, you get five reusable cloth filters and a very high-quality butane burner, although you can use this siphon coffee maker on a gas stove too. Now, if you’re intrigued by siphon coffee brewing but you’re concerned that the process might be too complex for you to get your head around, KitchenAid’s siphon coffee brewer may be the answer. This unit is automated! The coffee quality is very consistent and the full-bodied flavor is delicious. However, there’s no heating element in this machine, so you’ll need to drink the coffee as it’s made, or else it will quickly go cold. 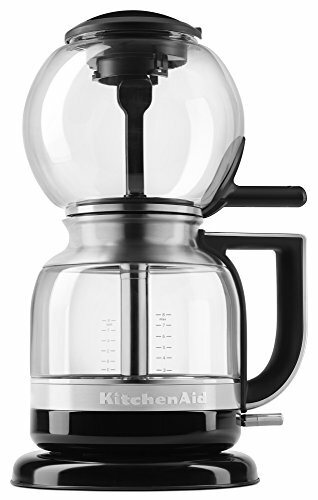 KitchenAid’s siphon coffee maker is made from stainless steel and glass, with no plastic componentry. The filter is made from stainless steel, so it’s easier to clean and maintain than a traditional cloth filter. On the downside, this automatic siphon coffee maker is on the expensive side, but the time, hassle, and guesswork you’ll save does make it worth the cost. So, now you’ve seen an overview of the best siphon coffee makers out there in caffeinating gadget land, let’s look at some other useful stuff you need to know about the kit and the process itself. Siphon coffee makers come as standalone or stovetop devices. The quality of the end brew is much the same. 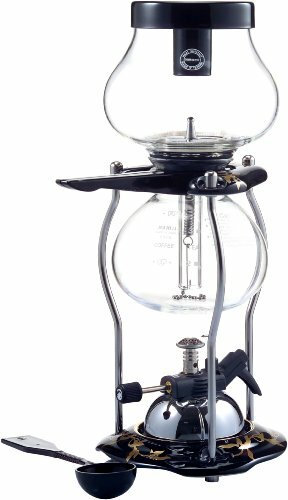 A standalone siphon coffee maker comes with its own stand with an integral or separate burner (alcohol or gas) that sits beneath the bottom chamber. A stovetop siphon coffee maker is designed to sit on top of your electric or gas stove. Be aware that you will need to place a diffuser between the unit and the heat source, as direct exposure could increase the risk of the bottom chamber cracking. We prefer the elaborate, vintage look of some of the standalone versions, although they are a tad pricier than the plainer stovetop units. Siphon (aka vacuum, syphon, or vac brewing) dates way back to the 1830s. In those days, brass and stainless steel were used in the construction of the machines. Elaborate pieces like these can still be found, but now they’re only suitable as ornaments from a bygone caffeinating age, rather than as practical pieces of brewing equipment. The best quality siphons available today have a body made from heat-resistant borosilicate glass. Although this doesn’t make these units indestructible, it does make them long-lasting if carefully looked after. The majority of siphon coffee makers have cloth filters, which are excellent at catching all the grounds from your brew. However, cloth filters are a pain to clean. You have to empty the filter, scrub it, and dry it so that mildew doesn’t begin to grow. If that sounds like too much hassle, look out for a model that has a stainless steel filter; these are a snap to clean. If you go for a standalone siphon coffee maker, you’ll need a burner to go with it. The burner that can be used with each siphon model depends on compatibility. Butane, gas, and alcohol are the most commonly used, but some newer machines have electric or halogen burner compatibility too. Alcohol is the cheapest burner option. That’s fine, but it can be tricky to control the heat until you get the hang of it, and you’ll also find a lot of soot will be deposited on the bottom of the siphon. We prefer a gas or butane burner. These are generally very reliable and are much cleaner and easier to use and control than alcohol burners. How many cups do you want to brew? Just like most other coffee brewing systems, siphon coffee makers brew in different size batches, usually ranging from 3 to 8-cups per brew. Remember to check the brewing capacity of the unit you buy to make sure it meets your requirements. When it comes to choosing the best siphon coffee maker for you, a major consideration will be your budget. If it’s your first foray into the art of brewing using a siphon coffee maker, you might not want to break your bank. Although having said that, some of the top-of-the-range models are so seriously great to look at; it’d be rude not to! So, how do you brew coffee in a siphon coffee maker? 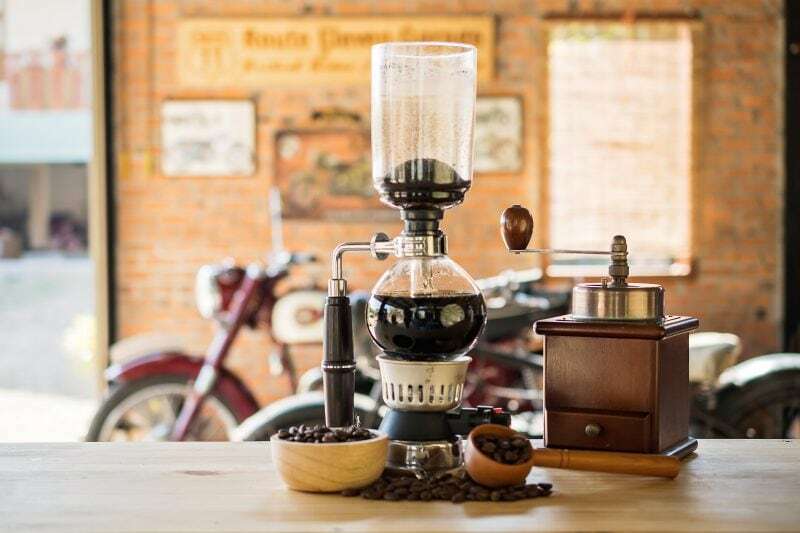 Brewing coffee in a siphon coffee machine is not as complex or difficult as you might think. Here’s how to do it. If your machine has a cloth filter, soak it in boiling water for a minute before you first use it. Measure out your coffee grounds as per the capacity of your siphon coffee maker and the desired strength of the finished brew; this stage can take a little practice until you get the balance right. Install the filter in the top chamber of the siphon machine. Pull the chain down through the chamber and fix it to the bottom of the siphon. Put aside. Boil some water and use it to fill the lower chamber of the machine. Put the upper chamber in place above the lower chamber. Once the water begins to rise into the upper chamber, add your coffee grounds and stir quickly to create a whirlpool effect. Allow the grounds to steep for a minute, and then swish them around again. Turn off the heat source. The liquid in the upper chamber will now gradually drain down into the lower chamber. And there’s your finished brew! Remove the upper chamber and set it aside ready for cleaning. Each time you use your machine, you’ll need to remove a cloth filter and clean it, following the maker’s directions. To prevent mildew from forming on the filter, put the cloth in a sealed container and store it in your fridge. Once a month, boil the filter for a few minutes. So, now you’re all prepped and ready to dive into the exciting world of brewing siphon coffee. You’re bound to find a brewer to suit your experience, budget, and requirements in our selection of top-quality products. Just match your preferences and go ahead to order your favorite. Happy caffeinating, you trendy thing you! If you are serious about brewing the best cup of coffee, you should take the time to recognize your mistakes and correct them so you can enjoy the best cup of coffee each and every morning. We bet you could be making even better French press coffee than you already are. Find out how, and then check out the best French press coffee makers available right now. Contrary to what you may have heard, this isn't the worst way to make coffee. You may even find brewing with a stovetop percolator to be a fun challenge. You've decided on making delicious coffee using either French press or pour over, but you're not sure which one is better. We've got the full rundown of pros and cons on these 2 popular coffee brewing methods. Learn how to make traditional Turkish coffee in your very own kitchen so you can enjoy this exotic coffee without having to travel to another country. Pouring good coffee down the drain is such a waste! If you've ever wondered what to do with leftover coffee, wonder no more. Stop throwing it out, and put that leftover coffee to work.